Final Drive began in 2001. The band at that time consisting of founding members, Nathan Easter – Guitar, Chris Nanney – Guitar, Andy Becker – Drums, and Casey Logue – Bass. Vocalist Jordan Gaw joined the group in October 2002. In March of 2003 Final Drive recorded their first group of songs at The Maple Room Studios. This release has been re-released as a digital release entitled “In the Beginning there were Three” available on our http://music.finaldrive.org/. At the end of 2003 and early 2004 Final Drive recorded their album “Good Things Come to Those Who Refuse to Wait” at Tiny Apertures in St.Louis Missouri. This album is available for purchase oniTunes or Listen for Free on Spotify or Soundcloud. After completion of the recordings on “Good Things” Casey Logue left the band and was replaced by Chelsea Muckerman. In 2004, Final Drive was chosen to be 1 of 8 bands to battle for a spot on Ozzfest 2005 on the MTV produced television show “The Battle for Ozzfest”. Newly added bassist Chelsea Muckerman was chosen by the show to represent the band and was filmed during Ozzfest 2004. In October 2004 Final Drive released “Good Things Come to Those who refuse to Wait” with Casey Logue and Chelsea Muckerman both performing during the Mississippi Nights CD Release show in St.Louis Missouri. Final Drive went on to tour extensively through 2004/2005 in support of “Good Things”. In May of 2005 Chelsea Muckerman and Final Drive parted ways and Final Drive entered Firebrand Studios to record “The Firebrand Sessions”. Matt Robinson joined the band on Bass to record the album. The Firebrand Sessions is available for purchase on iTunes or Listen for Free on Spotify or Soundcloud. With a slow in the recording process Final Drive went in on a split with theRend, also from St.Louis Missouri and released 3 new songs from the upcoming album on the split. 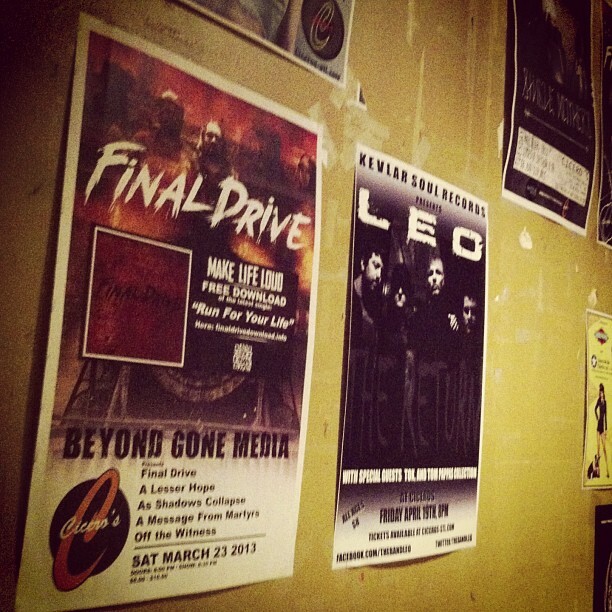 Final Drive and theRend toured the west coast in support. Final Drive to theRend Split is available at http://music.finaldrive.org/ . Funding cut short and Album unfinished, Jordan Gaw and Final Drive self produced the remaining work on “The Firebrand Sessions” and Digitally released it in 2007. Matt Robinson exited Final Drive and was replaced by Steve Kuehler on bass guitar. Final Drive went on to self produce and record the album “Under the Overpass of America”, touring and promotion followed. Under the Overpass of America marks the first release from Final Drive to hit iTunes and the other digital markets. Under the Overpass of America is available for purchase on iTunes . Listen for Free on Spotify or Soundcloud. November 2008, Andy Becker left Final Drive and was replaced shortly by Mike Brooks. Brooks was soon replaced by Ron Hampton on the drums. Touring continued for the support of “Under the Overpass of America” and in late 2009 Final Drive saw the departure of Steve Kuehler who was repleaced by Brock Parsons on Bass. Parsons left Final Drive shortly after and was replaced by Ron Tucker. In January 2011, Final Drive released the “IRON TIDES EP”, which includes recordings created during the 2009-2011 line up changes and features perfomances by Mike Brooks (drums), Ron Hampton (drums), Brock Parsons (bass) and Ron Tucker (bass). This release is available for purchase on iTunes . Listen for free on Soundcloud. 2012 marks the 10 year anniversary of the band. With a fresh new line up and a new record in the works, keep your ear to the ground for some heavy lifting by your new favorite band FINAL DRIVE.